On a visit to see family in N.Ireland we were so lucky to be treated to our very own guided tour of Parliament Buildings at Stormont in Belfast, known to locals as “the house on the hill.” This is home to the Northern Ireland Assembly and where laws and all things relating to the governing of the province takes place. One of our family friends works there, had often invited us to visit as his guest but until this break we hadn’t managed to co-ordinate dates. This time everything fell into place. Public tours of the building run regularly and are free, however on our visit we got to see everything the public tour normally covers but just a little bit extra as well. The building is so impressive. 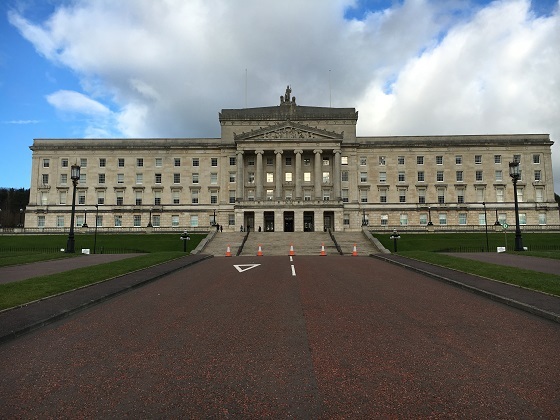 It was built in 1921 to house the newly formed government of Northern Ireland and although I had been in the grounds of the estate in the past I’d never made it inside. 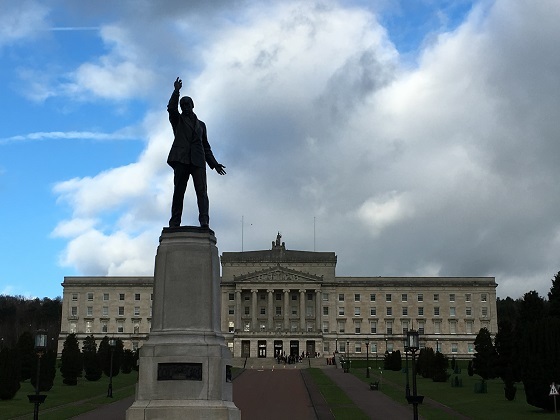 We admired the statue of Lord Carson on the drive – a most dramatic pose. We arrived in good time for our appointment and got to drive right up to the building and park close to the entrance. On an icy cold day we were quite pleased we didn’t need to walk up the avenue from the main gates – it is exactly one mile long. A quick security search and then we got to approach the impressive entrance with its six pillars representing the number of counties in Northern Ireland, there are also six floors in the building. Into the Great Hall and Son was very excited to see our names on the notice board as guests for the day. Tea and coffee were very welcome, then we had our own personal tour guide who took us around the building. Our friend had come to greet us but needed to dash back to the Chamber as he was speaking at that time on a Bill. The Great Hall is very impressive and somewhere I could have sat for a very long time – there is plenty to look at and take stock. It is richly decorated with an incredible ceiling, untouched since it was first painted in 1932 thanks to a secret waxing process. A stunning gold plated chandelier hangs in pride of place – a gift from King George V. It originally hung in Windsor Castle and had been a gift from Kaiser Wilhelm II of Germany. It was removed and placed in storage during World War 1 and was never hung in Windsor again. As well as being a beautiful place to sit, there was a lot of coming and going and much hustle and bustle in the Great Hall. Journalists, television cameras, politicians and lots of famous faces were rushing about. We enjoyed all this drama and could have watched that for longer too. Our guide took us into the Assembly Chamber while a debate was underway. We sat quietly in the gallery and listened. No great orators here though and it was, dare I say, rather boring. 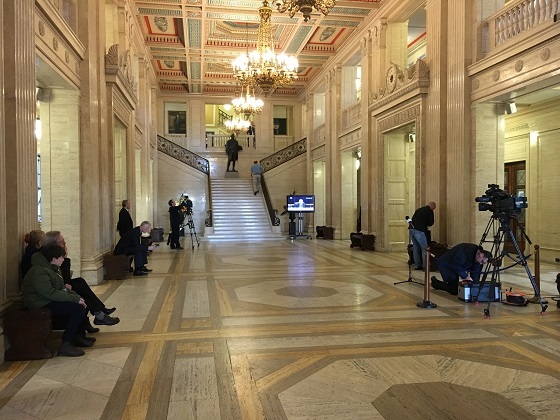 Apparently this is the norm, the coalition agreement in Northern Ireland means only one person can speak at a time, totally unlike the process at Westminster and nowhere near as thrilling. We met our friend for lunch and while dining were surrounded by many more famous faces. He took us into the Senate to have a look at this very grand room with red leather seats and two blocks of benches. 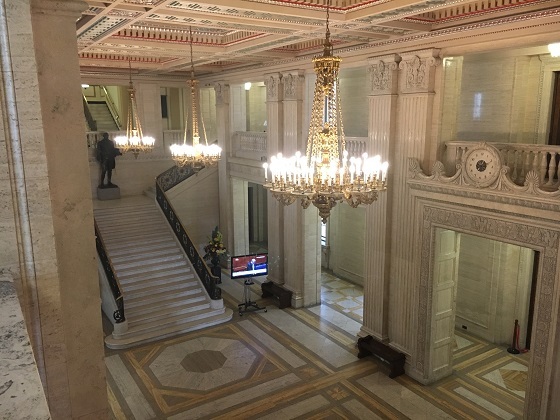 Beautiful old Irish damask lines the wall and we got a close up look at the two paintings, one showing the state opening of the parliament in 1921 and the other is a group portrait of the first assembly after the 1998 elections. We were on our way to the Ministers’ tea room when we bumped into the then First Minister Arlene Foster (an election is pending in the province). She was on her way out but our friend called her back to chat and asked if we could take a few pictures. She was very gracious, invited us into her office and chatted for quite a while. Son was very taken with her and is very proud of his photo souvenir of the day. Tea and biscuits in the gorgeous old tea room then we left after a fascinating, fun and definitely memorable day. I was the same Rosemary, always hearing about it on the news so it was very exciting to get inside and see what goes on there. The hustle and bustle was great to observe and seeing behind the scenes too was great – we were very lucky! Hope your week has gone well too and you have a great weekend. We enjoyed our visit and public tour last August, and got to sit in the Chamber, but I’d have loved to get behind the scenes as you did. We were very lucky to have this experience and enjoyed every second of it – a real privilege! This sounds like it was absolutely fascinating day. And what an experience for your son. Your blogs are always really interesting. We were very lucky to get a behind the scenes tour like this one and all of us were so impressed! My son is still talking about it, I don’t think it is something he will forget! It is so interesting to get an insiders view isn’t it Suzanne – your experience must have been similar to ours! Totally. We visited with a deputy (member of Parliament) so he was able to tell us more about how everything works. It was indeed fascinating. What a splendid day out! 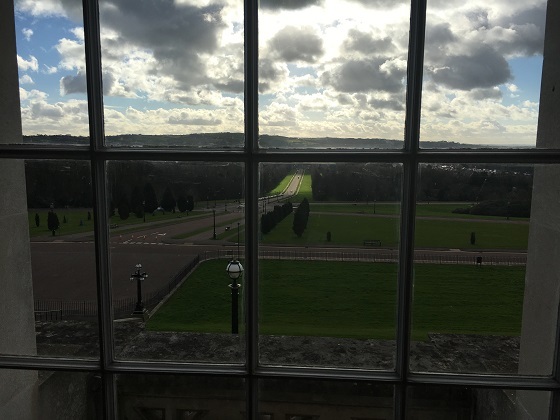 We visited Stormont a few years ago and took the public tour and walked up and down the mile long drive twice for our bus stop! How marvellous to have a private tour and see more of the building. I’m sure you will all have fond memories of the visit for years to come. It was such an interesting and memorable day for all of us. We enjoyed the tour and seeing the inside of the building and then getting to do all the extra bits was a real treat and such an experience. Our son was thrilled by the whole day – we all were! It is stunning – I love that ceiling! Always nice when you have a friend at places like these to get the “inside” tour! I’m so intrigued and impressed by the painting and waxing process in the Great Hall..looks incredible, and so fresh. Have a good weekend Joy! 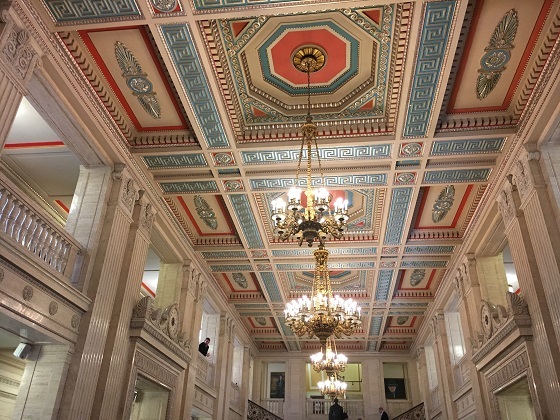 I loved the ceiling too – so impressive it looks like this without a touch up after all those years! We had the best day and felt very privileged to get the insider story! Hope your weekend is a great one too Corey! Sounds such a fascinating day. 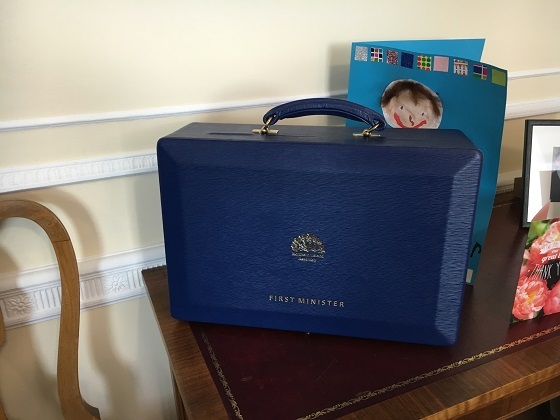 How lucky you were to have a personal tour and to see a debate – even if it was a bit dull! It didn’t have the thrills and spills of Westminster but yes, we were still really glad to have seen it!! The whole day was great though, such a lot to see and so interesting. What a great day, I’d like to see that! It was interesting to see behind the scenes as well – we all enjoyed it. I don’t know why I didn’t expect it to be so opulent but it’s magnificent. What a beautiful building. It is very grand and lovely – that ceiling especially is a feast for the eyes. I couldn’t take pictures in some of the other places including the Senate Room – that is special too. The building is beautiful, Joy especially the ceiling. What an educational trip for your son and so nice he got to meet the First Minister! It was a really special day Pam, full of interesting things and so much to remember! Lovely photos! 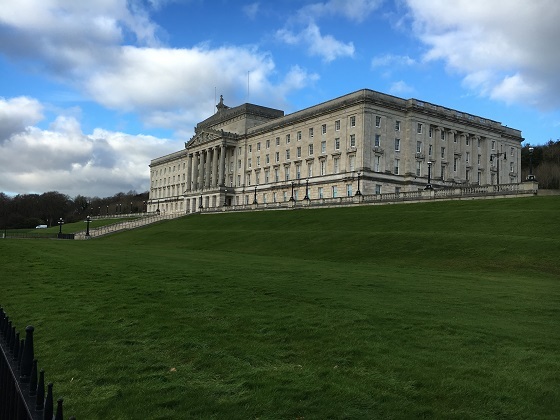 I absolutely loved my visit to N. Ireland and hope to get back someday. This lovely building will be on my list! It is a great place to visit Hilary if you do manage to find yourself in Belfast! We loved the day – so interesting! That’s quite a building, Joy. Gorgeous! Having grown up seeing it on the news all the time George it was quite the experience for me to finally see what was inside. I wasn’t disappointed! Wow! We only drove by on a very interesting bus tour. We’d done that tour before and had the same experience – nice to see inside this time! Beautiful building, here is to hoping the politics sorts itself out soon!